Practices will be in February and into March; games are played March - May. Opening day is March 7. We are always in need of volunteers as managers, coaches, team moms, etc. Please complete the 2015 Volunteer forms. Players MUST LIVE within the boundaries of Tamarac Little League, which encompasses Tamarac, parts of N. Lauderdale and Lauderhill, and most of Sunrise (see map) To complete registration, you MUST provide an ORIGINAL, certified proof of age document (birth certificate) (NOT a photocopy) along with at least three (3) different proofs of residency. These documents may be brought to any in-person registration or to tryouts in January. THEY MUST BE RECEIVED NO LATER THAN TRYOUTS OR YOUR CHILD MAY NOT BE PLACED ON A TEAM. · Utility bill (only one of the following may be used): electric; gas; home or cell phone (if not on internet/cable bill); water/sewer/garbage. Tee ball players, ages 4, 5 & 6, DO NOT need to tryout (but must turn in required documents). All other players, including 6 year olds playing up in Coach Pitch, must try out. Tryouts are mandatory - players who do not try out may not be placed on a team. Tryouts will be held at our usual baseball fields in the Tamarac Sports Complex, 9901 NW 77 St, Tamarac. Wednesday, January 28 will be make-up day for everyone who missed Tuesday. You will also need to sign the Sport Parent Code of Conduct and a City of Tamarac Athletic Release. You can download those forms - click here. Tamarac Little League firmly believes that each child who wishes to play baseball should be entitled to do so regardless of skill, gender, or financial circumstances. Our league will not deny any child a chance to play baseball due to a financial hardship. Please contact the league for more information. 1. Is this a competitive season? Although Little League baseball is a recreational youth sports program, the spring season is a competitive season. Standings are kept and there are usually playoffs at the end of the season. Players are assigned to the division based on their age according to the Little League International age chart (link). While Tamarac Little League does it's best to make sure that every child learns baseball skills and gets to play, regardless of ability, it is the parent's obligation to make sure the child gets to clinics, practices and games, on time and ready to play. 2. What does my registration fee pay for? For the spring baseball season, the league provides a baseball hat, pants, jersey, belt (except tee ball), and socks for each player. It is your responsibility to ensure you have ordered the correct size for your child(ren). The rest of the fee covers administrative expenses, charter fees, insurance, trophies/awards and umpire fees. Income from the concession stand is also used to pay the umpires to help keep registration fees low. 3. What do I need to provide? Players must supply their own baseball mitt, bat, helmet and plastic baseball cleats (50/70, Juniors and Seniors ONLY may wear metal cleats). We have information about purchasing a glove on the Parents page of this website. We also have advice on the Parents page on buying a bat. 4. When will teams be chosen? An important part of our program is fair and balanced teams. We have try-outs/evalutations with varying dates and times depending on age level. Tryouts will take place January 27 & 28 at 6pm. See schedule above for more complete information. The draft process takes place once try-outs are complete. After all the try-outs have been completed, the managers go through their draft process. The draft is for managers ONLY. Parents and players may not attend. Teams are confirmed and the managers will be in touch with each of their players. You will be contacted after the teams are selected. The manager of your child's team will let you know when the team will practice. The practice times are chosen by the manager. Practices begin February 3, but that DOES NOT mean you will practice on that day! Your team manager will let you know what days you have practice. If you have not heard from you manager by February 3, please contact the player agent. 5. What days are games played? Tamarac Little League schedules baseball practices and games on Monday, Tuesday, Wednesday, and Thursday evenings and Saturdays. We try to avoid Sundays except for make-up games. 6. What time are the games? Tee Ball and Coach Pitch games (ages 4 - 8) usually begin around 5:30 pm on weeknights. Tee ball games may last up to 1 hour 15 minutes. Coach Pitch games are usually no more than 1 hour and 45 minutes. Most others start around 7:30 pm and are about 2 hours. Juniors and Seniors games may be 3 hours or more. Saturday game times are usually between 9 am and 6:00 pm. 7. 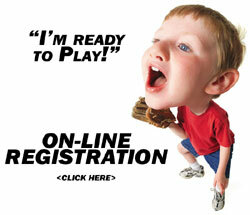 My child is registered for _____ (Tee Ball, Coach Pitch, Minors, etc.). What nights will she/he have practices/games? We generally don't assign specific nights for specific ages. Managers chose their practice night according to their personal schedule after teams are chosen. Games may be played any of the days we play. We try not to schedule more than one weeknight and one Saturday game for each team, each week, but some teams may play three games in a week. 8. Who will be my child's coach? Tamarac Little League makes every effort to choose the best managers and coaches available. Managers and coaches should enjoy working with children and be willing to devote their time and energy. We look for people who know baseball, but most importantly understand this is for the children. While we want to have competitive teams, we are a recreational league. All our coaches are volunteers, just like the officers and board of directors. Managers and coaches are chosen by the board and approved by the president. ALL Little League volunteers must pass a national background screening. 9. What are the age groups/divisions? These are general guidelines, the Board of Directors reserves the right to make changes in division makeup as necessary for the best interests of the league, and players may be adjusted up or down depending on experience and skill. Team makeup depends entirely on how the teams are drafted. A child's playing age is determined by the 2015 Little League age chart (link). 10. How long is the season? Do you guarantee a minimum number of games? What about rained out games? The Spring 2015 season will be approximately 10 weeks. Every effort is taken to ensure a balanced season for each team, with at least two games per week. Because we have no control over the weather or the city closing the fields, we cannot and do not guarantee any more than the required minimum number of games (12) will be played during the spring season. We will generally schedule 16 to 20 games per team, and we will do our best to reschedule games which are rained out, but there simply may not be a time or field available to make up every game. Tee Ball teams do not play more than twice in a week (which means rained out games will not be rescheduled if it forces a team to play 3 games in a week). Tamarac Little League has a no refund policy (see below). Tamarac Little League is a not for profit organization and has a no refund policy in place. The only two reasons for which a refund may be granted are a medical cause (injury/long term illness) or you are moving out of the boundaries. Refunds must be approved by the Board and will be sent to you as soon as practical.